Full text, in J. Berry-Slater and P. van Mourik Broekman, eds. Proud To Be Flesh: An Anthology of Cultural Politics after the Net (London: Mute/Autonomedia), 2009, pp.391-98 [republished from Dis-Integrating Multiculturalism – Mute 2:2, 2006, pp.34-33.]. If for a certain imaginary, the beach has often evoked a realm of authenticity hidden under the concrete strata of urban development, capitalist spectacle and exploitation, the relentlessly iconised Australian beach has, in addition, been put to use as proof of egalitarian sentiment and vast democratic horizons. Here, the generic vista of the Western frontier is shorn of its embarrassing wars over land, the guns and forts lined up against the natives, and redrawn as pre-economic, pre-political idyll. Never quite acknowledged as urban but, even so, presented as more urbane and civilised than either rural, uncultivated or desert lands, the space of the beach is assumed to have shaken off the dissensions of politics and economics much as the figurative beachgoer is presumed to effortlessly shed clothing. Like Rousseau’s state of nature, the mystical space-time of the beach operates as both a denial of the nation-state – the presupposition of the contrat social in its legal, political and not least, economic senses – and its naturalisation. And no more pronounced are these projections than in post-colonial spaces such as Australia, where persistent anxieties about unruly savages mingle with dreams of being closer to nature. Popcultists have long campaigned for ‘the beach’ to be recognised as Australia’s eminent utopia. Some five years ago, Craig McGregor argued that the beach represents ‘our yearning for a world different from the concrete pavement universe that most of us inhabit for most of our lives. The beach today represents escape, freedom, self-fulfilment, the Right Path. It represents the way our lives should be.’ Similarly, John Fiske contended that the beach ‘is the place where we go on holidays (Holy Days), a place and time that is neither home nor work, outside the profane normality.’ It is perhaps not surprising that such homilies have become more pious just as coastal areas have become more developed, increasingly the scene of bloated property values, mortgage anxieties and a burgeoning tourist industry run mostly on precarious labour. Indeed, these hymns to ‘the beach’ are a crucial affective support in this political economy and these industries. And they leverage affection all the more fiercely when deployed as eulogies or calls to restoration. Therefore, it is in part because beachside suburbs do not provide for an indifferent repose – longed for as both fortress and refuge against difference – that they have become the scenes of overt violence, riot police and emergency ‘lockdown’ laws that seek to restore, by force, the order on which seaside utopics were assembled. The enchantment of ‘the beach’ began in Australia in the late 1940s – which is to say, in the immediate post-WWII period and at the ideological high point of Fordism and the Keynsian settlement. That post-war accord between unions and employers took shape as a nationalist compact between descendants of the English upper classes and working class Irish. Persuaded by clerical anti-communism, promises of property and class mobility – in the form of the post-war housing ownership boom and university admissions – the latter were seduced into forgetting their genealogy as convicts deported from Britain under policies justified by their depiction as a separate ‘race’. This particular racialisation was set aside with the post-WWII Anglo-Celtic compact, which is the precise meaning of the figure of the Aussie and its egalitarian ethos – which is also an ethnos – of the ‘fair go’. Frozen in that dehistoricised and dreamlike zone after colonisation had been accomplished and before the collapse of the ‘White Australia’ policy in the early 1970s, the ostensible peace and contracted civility of the emblematic beachside has always depended on violence and separation, borders and fencelines, property and expropriation. In the final month of 2005 in Sydney, it was these contingencies that would be laid bare and, with recourse to emergency laws, reasserted as necessary for the restoration of what was deemed natural. It is not clear what the immediate inducement was. Lifeguards were assaulted, it is said, because they made racist slurs while attempting to stop people playing football (soccer) on Cronulla beach and, in the ensuing fight, came off second best. Cricket and Australian Rules (i.e., Celtic) football are commonplace on beaches and elsewhere – soccer, on the other hand, is regarded as the ‘wog’ game. Moreover, lifeguards are drawn from local residents, and their role is just as much concerned with beach safety as it is with enforcing the bonds between property and propriety. Yet, their authority on this occasion, derived as it is from a customary consensus over their iconic status, faltered. And so, this apocryphal confrontation over land use and the perceived failure of Aussie supremacy would converge with earlier tales in Sydney of ‘organised ethnic gangs’ rapes of Australian women’ and fears of miscegenation (in which women’s bodies are considered above all as racial property) to produce what, elsewhere, would be called a lynch mob. Our parents came to this country and worked hard for their families. We helped build this country and now these racists want us out. […] Time to show these people stuck in the 1950’s that times have changed. WE are the new Australia. They are just the white thieves who took land from the Aboriginals and their time is up. 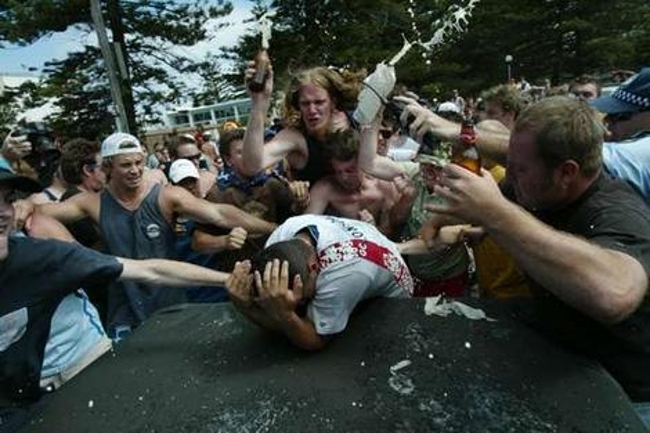 In the midst of this, the NSW Police Commissioner remarked that the Cronulla rally to ‘Take Our Beaches Back’ was a ‘legitimate protest’. It was, according to him, born of a ‘frustration’ with the failure of the police and the state to do their job, which is to say, to ensure the Australian border remained securewithin Sydney. The Prime Minister insisted that the problem of ‘ethnic gangs’ – which he unequivocally denied those at Cronulla might be regarded as – should be left to ‘policy’, ie, the state. On the third day of rioting, the NSW Premier announced emergency laws to give police, among other measures, the power to ‘lockdown’ those beachside suburbs under threat. This was, he declared, a ‘war’ and the state would ‘not be found wanting in the use of force’. And so the task of the Cronulla pogrom was more smoothly accomplished by the police acting as border guards, refusing entry to the beaches to those who could not prove that they belonged there. The ‘lockdown’ laws, in summary, allow the state to remove entire suburbs from the ostensibly normal functioning of the law for periods of 48 hours. Among other things, and within the designated ‘lockdown’ zone, the laws remove the presumption of bail for riot and affray, allow for the area to be cordoned off to prevent vehicles and people from entering it, empower police to stop and search people and vehicles without warrant or the standard criterion of suspicion, and to seize cars and mobile phones for up to a week. Yet there is no experience of labour in capitalism that occurs outside a relation to the border. This association does not arise simply because migration controls create legally-sanctioned segmentations within and between labour markets that, in turn, condition or ‘socialise’ the labouring circumstances of both immigrant and citizen. Nor does it occur only because, for instance, it is possible to show that the recent tendencies toward temporary residence permits and that of so-called ‘flexibilisation’ were both responses by employers and governments to a similarly coincident and prior exodus from the Fordist factories and the ‘Third World’ in the 1970s. Nor is it solely due to the fact that jurisdictions, currencies and the hierarchical links between them are manifest in every pay packet – although this is so obvious and therefore naturalised that it often needs emphasising. If then there are opponents when the social compact is made, their opposition does not invalidate the contract, but merely prevents them from being included in it. They are foreigners among citizens. When the state is instituted, residence constitutes consent; to dwell within its territory is to submit to the Sovereign. Just as Rousseau’s perfect circle of democratic despotism cannot do without the ‘foreigner’, there is no semblance of the wage, as wage contract, without the border. This is the contingency of a specifically democratic capitalism, relating as it does to a certain axiom of money as universal equivalent and seemingly competent measure of all things, while preserving all the ambiguities through which repression, inequality, slavery and, not least, surplus labour-time are explained and stabilised. Given that there is no way in which someone might profit at the expense of another through an agreement that is indeed symmetrical, as the wage contract is asserted to be, racism (and sexism, which is never far away) prepares us for, distributes and rationalises asymmetry. The contractarian braces the contingent world of capitalist exploitation by ascribing it to individual authorship. Where this risks destabilisation, either by dissent or in the undeniable presence of inequality where all are born equal, the figure of the foreigner is put into service in the guise of the unpatriotic, the unassimilable and those deemed to be, for reasons of biology or ‘culture’, incapable of signing a contract, of the very capacity of individual authorship. It is the latter that most clearly emphasises the bond between exploitation and racism, between the surplus as understood by political economy and the extrinsic (the foreign) as conceived by demography. The question then is, as it always was perhaps, how unpaid labour (or exploitation) is distributed, as well as whether it is counted or not. The Cronulla pogrom was as much about space, belonging and property as it was about relative advantage: about who is counted and who is detained, who might be said to possess one’s labour such that they might contract for its sale and who might be said to be a slave. Here, one might note the ways in which certain migrants are held up at the border, airport and detention centre, no less than the ways in which the banlieueshave existed as a de facto space of internment. In this time of detainment, it is not labour (as something that might be disassociated and ‘sold’ by one’s self) that is stolen, but whole lives. It is not surprising, then, that the moving mêlée emerged here, as both description of a response to the Cronulla pogrom as well as apparition of chaos. Neither discernible as individuals nor enumerated as collective, with an emphasis on motion that is as spatial as it is temporal (appearing as quickly as it disappears), the moving mêlée had a whirlwind temporality that provisionally cut through the time of detainment even while it failed to escape it.